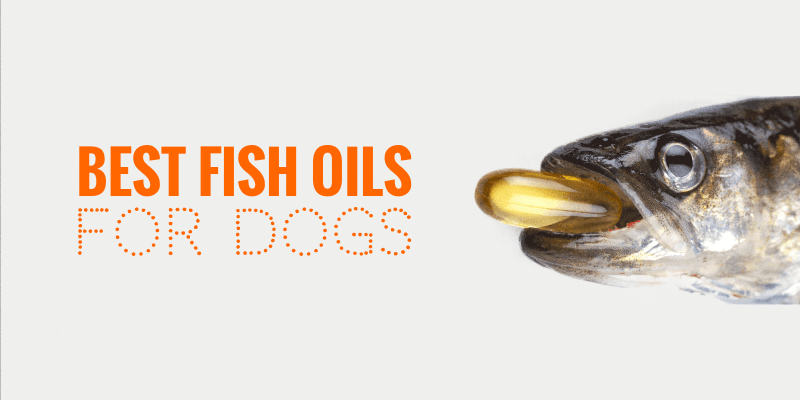 Top 5 Best Fish Oils for Dogs — Cod Liver Oil, Salmon Oil, DHA, EPA & DPA! Fish oils for dogs are a very cost-effective way to increase the intake of healthy fatty acids including polyunsaturated fats and monounsaturated fats. Different dog fish oils offer different ratios of omega-3, omega-6, and other healthy micronutrients. Having the right amount of fatty acids in fish oils for dogs is not enough: they must be bioavailable. Meaning, different qualities of fish oil may offer the very same amount of essential fatty acids but once digested, premium dog fish oils will be more available for the dog’s body to use and store. Therefore, quality matters, quantity matters, and the ratio of omega-3 and omega-6 matters. Supplements for dogs (and humans) are a lot less regulated than actual foods, therefore the dog owner must be wary of all incredible claims because they may not be factual. And yes, cod liver oil, salmon oil, and other fish oils for dogs are considered supplements. Additionally, dog fish oils are not magic health supplements for dogs: they may take weeks to show visible effects, they aren’t the cheapest, but they are indeed wonderful in the long run. The Carlson brand has been specializing in Norwegian cod liver oil since 1965. It has been rated the number one fish oil brand for 2017 by several consumer websites. Carlson Cod Liver Oil delivers you 100% pure Norwegian cod liver oil from artic Norwegian waters. The oil comes directly from liver tissue of fresh cod using a completely chemical-free process. You can rest assured that there are no hidden nasties in this product — the only delightful addition is a natural lemon flavor to make the product more palatable and less stinky! This fish oil was awarded the Superior Taste Award 2010 by the Brussels International Taste and Quality Institute. Many customers have also reported that the smell of fish is eliminated completely. Carlson Cod Liver Oil is packaged in Norway. It’s stored in nitrogen-flushed bottles, which also contain vitamin E for guaranteed freshness. It contains 1000mg per teaspoon of omega-3s such as docosahexaenoic acid (DHA) and eicosapentaenoic acid (EPA) which have anti-inflammatory properties and support healthy eyes, brain and heart. The fishy product also contains vitamins A and D to support lung, liver and kidney function as well as a healthy coat, fur, and bones. The required daily dose is one teaspoon daily with a meal which couldn’t be easier — simply add it to your dog’s food! Once open, the product stays fresh for 100 days — value for money! Natural lemon flavor is more appealing to fussy dogs who do not like fish and does not leave your dog with fishy breath. Customers report suppleness of joints and improvements in neurological disorders with prolonged use. This product is tested regularly using AOAC international protocols to ensure it remains free from harmful levels of over 28 potentially harmful contaminants such as mercury, cadmium, and lead. On the downside, this product is quite expensive, but the health benefits that your dog will gain are invaluable! You can’t put a price on health after all! Doesn’t have a pump mechanism like some of the other fish oil brands, so it’s a bit messier! Grizzly Salmon Oil is drawn from the skin of the Wild Alaskan Salmon at the same time as salmon fillets are prepared for human consumption. As well as containing omega-3s such as EPA and DHA like many other fish oils, salmon oil also naturally contains vitamins A and D and omega-6 fatty acids. The delicate balance of omega-3 and omega-6, allows omega-6 to provide additional benefits such as reduced blood pressure, a regulated metabolism and a stronger immune system. Salmon oil also has some naturally occurring antioxidants which are linked to the prevention of cancer in dogs. 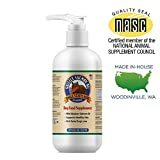 Grizzly Salmon Oil contains only two 100% natural ingredients: salmon oil and rosemary extract, which acts as a preservative. The product comes in a plastic bottle with a pump dispenser on top, so the oil can be quickly pumped straight onto your dog’s food. The fish oil contains 500mg-2000mg of fatty acids per serving, depending on the size of your dog. The label will tell you just how many pumps your dog should be getting! 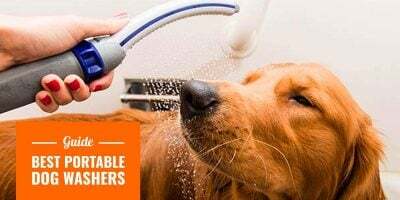 It can sometimes be different to please both dog and owner when it comes to scent — dogs are wild animals after all and they tend to love anything stinky. This oil has a mild salmon smell and flavor which most customers tolerate, and most dogs adore. Customers report huge positive changes in the quality of the dog’s coat. Dogs are left with silky, soft, waterproof coats and shedding is very much reduced. Results dramatically benefit most dog breeds, from the Cocker Spaniel to Great Dane! The bottle has a mess-free pump mechanism, so you don’t have to faff around with teaspoons. Here as well, Grizzly Salmon Oil is quite pricey but you get what you pay for — high quality! The fishy flavor may not suit fussy dogs who do not like fish, which is hugely disappointing for such an expensive product but fortunately, I have never met a dog that relinquishes fish. Wild Fish Oil has built its reputation on its pure and environmentally-friendly manufacturing process. It is derived from North American Menhaden fish, also known as Mossbunker fish. Wild Fish Oil is one of the world’s only fish oils to be certified by Friends of the Sea. The process of fishing and converting Menhaden into oil in the US does not disrupt the already fragile aquatic ecosystem. This fish oil has a subtle lemon flavor and virtually no fish odor at all. You can give your dog all the cuddles you want without fear of fishy breath! Although this fish oil has a natural lemon scent/ flavor, it also contains vanilla extract to further improve taste and rosemary extract for oil preservation. All ingredients used are 100% natural. 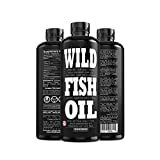 Wild Fish Oil contains a whopping 3240mg of omega-3 fatty acids per teaspoon and includes both EPA, DHA but also docosapentaenoic (DPA). DPA provides additional support for blood vessels and blood clotting. The required dosage of Wild Fish Oil is 1-3 servings daily with food, depending on the size of your canine. The molecularly distilled oil is one of the purest out there, making it quick and easy to digest. Omega-3 fatty acid levels are higher than those in many fish oils while remaining cheaper than a lot of other fish oils on the market. Again, and it is worth repeating, this Menhaden fish oil follows a production process that is environmentally friendly. The flavor and scent of this dog fish oil are generally loved by all pooches but please note that the subtle lemon scent and flavor may potentially be a little too overpowering for some dogs. Iceland Pure Unscented Fish Oil is made from sardines and anchovies which are harvested from Icelandic and Norwegian waters. These waters are considered some of the purest in world. Additionally, the oil has a rapid molecular distillation time (45 seconds at 250 degrees) compared with other fish oils, guaranteeing that no trans-fats are created in the manufacturing process. The process also removes such high levels of toxins that the fish oil can be classified and labelled as toxin-free. This purified fish oil contains 1296mg of omega-3 fatty acids such as EPA and DHA per teaspoon. It also contains tocopherols — organic chemical compounds which have vitamin E activity. Vitamin E is helpful in preserving the fish oil. This product has many of the same benefits as other oils in this review. It promotes heart health, acts as an anti-inflammatory, and is thought to prevent cancer and promotes a healthy coat and skin. Iceland Pure Unscented Fish Oil is stored in epoxy-coated aluminum bottles for freshness. The bottles are GDA approved to hold liquids suitable for human consumption. Epoxy coating is hard like glass; it does not break down over time so it avoids any contamination of the oil. These days it is quite rare to come across bottles that do not degrade with age; it’s somewhat of a luxury. The bottle also has a no-mess pump mechanism for efficiency — add it straight to your dog’s food! Quick results can be expected: many owners report an improved in their dog’s overall health within 4 weeks. The oil is tested regularly for purity by third-party licensed testing parties. Customer reviews noted that this dog fish oil relieves dry itchy skin and is great for dogs with sensitive skin. It also seems to have lower mercury levels than salmon oil, and it is not as expensive as some of the other fish oils on the market. This pure fish oil is odor-free (as you may have guessed from the title!) which is great for picky dogs. This can be a benefit but also a drawback as some fussy dogs will not eat something that has no sensory appeal. Such odorless fish oil should probably be mixed with your dog’s food. Yes, these Polka Dog Bakery Cod Skins are not a fish oil, but they seem to be a massive hit with dogs and their owners. The crunchy fish sticks, made from locally sourced cod, are caught in season by local fisherman who travels in small boats from Maine to Cape Cod to Alaska. These delicious fish skins are suitable for dogs with a sensitive tummy. The cod skins are hand-rolled and slowly dehydrated to increase the bioavailability of the micronutrients. Made from 100% cod skins, they are high in omega-3 fatty acids and make for a healthy treat for your dog. They still have the same benefits as fish oils, but it is likely your dog will love you forever for choosing this fishy treat! Some dog owners say they have never seen their dog as excited as when Polka Dog Bakery Cod Skins arrive through their door — dogs go wild for them! These crispy sticks are approximately a foot in length. They can be easily broken up and fed to smaller dogs, or given whole to larger dogs. The regular consumption of quality fish skin should significantly improve arthritis in dogs. The crunchiness, the smell, the taste… Fish skins are hugely appealing to dogs — they REALLY cannot get enough of them. If dogs had a say in how they got their essential fatty acids, this would probably be it! Additionally, the bag comes in a huge in size, which is great value for money. Lastly, the packet does not provide much nutritional information which is a little annoying but they cannot be bad… they are cod skins! Your site is fantastic. I lost my wiener dog to cancer, and I am making a special effort to prevent it in my other dogs as best I can. Making my own food is my start – and your site is so insightful. Thank you so much for this info.